With a combined sum of two and half centuries of shipbuilding experience, the new Spanish shipbuilding conglom- erate, IZAR — billed as shipbuilding's new one-stop shop — is hardly a neo- phyte entering the highly competitive world of international shipbuilding. Bazan and Astilleros Espanoles, IZAR (which, in Spanish, means "to hoist") immediately becomes the world's ninth largest shipbuilding group, with a cumulative orderbook approaching four billion Euros. A toned behemoth intent on recapturing market share across a broad spectrum and led by Jose A.
Casanova, chairman & CEO, the com- pany is embarked on a plan of prudent investment in technology; technology aimed at enabling its facilities to com- petitively compete in the building of high-value ships with any yard of its stature, located anyplace in the world. Cadiz, among other locales, in support of its burgeoning naval operations. In the early 1900s the company expanded its repertoire with an entrance in the commercial business, with new yards built and re-built around Spain. Eventu- ally, the military business was spun off into Bazan, and the recent move — the culmination of a plan by SEPI — is sim- ply putting the company back together. While there ultimately is a plan to take the company private — the Spanish government and SEPI having published this intention — Casanova admits "we are on the list, but we are far down on the list." A cornerstone of IZAR's plan to make the organization efficient, competitive and profitable is investment in techno- logical upgrades throughout its 12 facil- ities, upgrades that will foster creativity and new marine solutions, helping it to not only fulfill but to keep a step ahead of customer needs and market trends. In total, there is currently in excess of 700 million Euros earmarked for investment in "Process and Innovation" projects, including development of new fast transport ship types, cruise vessels and naval ships. The philosophy come from the new management's intent to prioritize inno- vation, specifically by developing and perfecting a portfolio of innovative products, increasing productivity, and offering added-value products with high-tech content. Providing the glue for this plan, according to Casanova, is the synergy that is inherent in the coupling of a com- mercial and naval shipyard, and he clas- sifies this synergy as the primary strength of the new organization. For example, the naval side of the business will lend an invaluable access to a level of high technology uncommon in most commercial marine sectors. As shipowners — driven by international, national and regional regulations, as well as the constant push for increased lifecycle performance and increased cost efficiency — are demanding and receiving unprecedented levels of tech- nological product and system develop- ment. Similarly, the military side of the busi- ness can benefit from streamlining of process and materials procurement inherent on the commercial side. While today's orderbook is more heavily skewed toward naval business, the new company optimally will enjoy a 40 percent military, 40 to 50 percent commercial and 10 percent "other" split of business. 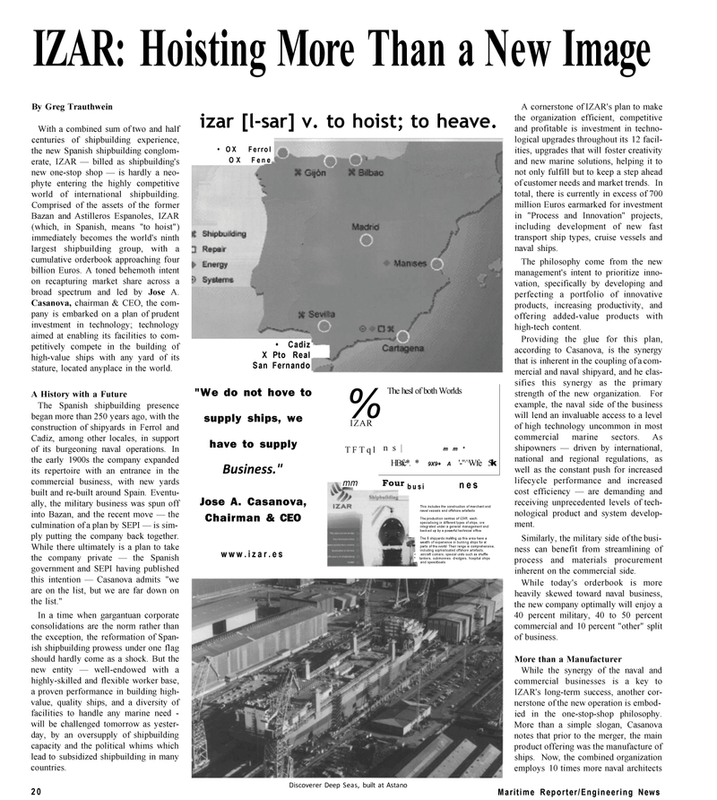 IZAR's long-term success, another cor- nerstone of the new operation is embod- ied in the one-stop-shop philosophy.